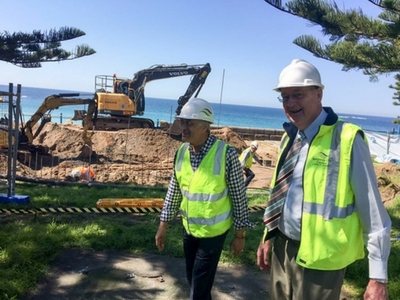 The Mayor of Randwick Noel D’Souza today, 6 September 2016, officially broke ground on the construction of new toilets, showers and change rooms on the lower promenade at Coogee Beach. The new facilities will provide 21 new toilets and 12 showers including accessible cubicles, male and female change rooms, a family change area with additional showers, public lockers and a new Lifeguard Office and kiosk. The work is part of Randwick City Council’s ongoing commitment to improving facilities and services for residents and is expected to be completed in 2017. Mayor Noel D’Souza said extensive community consultation showed strong support for additional toilet facilities along the Coogee promenade. “We’re really excited construction is underway, as many residents have told us that there is a need for more toilets, change rooms and showers closer to the beach. The beach will remain open at all times and Council’s Lifeguards have been temporarily relocated to the Centre promenade while the work takes place.